Do you feel the warmth in the air? Can you smell the sweetness of freshly-bloomed flowers? The birds are chirpier, the trees are standing taller and everything just feels a little more ‘alive’. 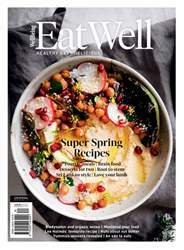 In EatWell #20, you’ll find over 100 healthy recipes perfect for celebrating the spring season – and, our fresh, new look. Delight family and friends with brain food dishes, “fourth” meal ideas, healthy lamb recipes and impressive cheese platter tips. Discover a whole recipe section dedicated to guilt-free desserts that will leave your mouth drooling. 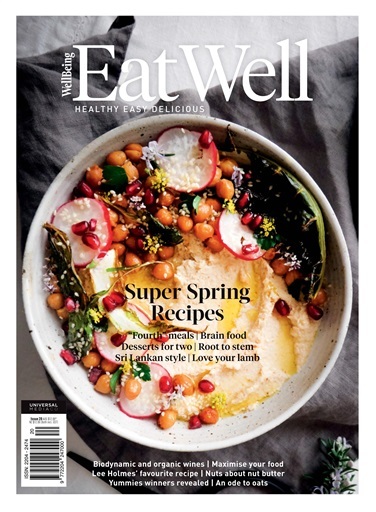 You’ll meet the EatWell Yummies Awards winners, sample our new cookbook feature, discover Lee Holmes’ all-time favourite recipe and find out the latest food trends to hit cafes all around Australia. Speaking of Australia, did you know that Australians throw away around $2.67 billion worth of fresh food every year? In this issue, you’ll learn how to reduce food waste with our delicious collection of root-to-stem recipes. We also take a look at new ways to maximise your food, the difference between organic and biodynamic wines, how to grow oats and the simplicity of making nut butter. And, if you’re still hungry, read the latest food news, which fruit and vegetables are in season and loads more!